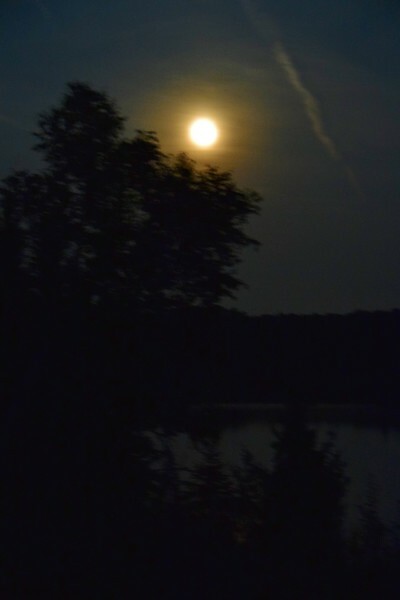 as the moon was still hanging in the sky behind us. I walked down to the dock to see if I could see a moose or any other wildlife. 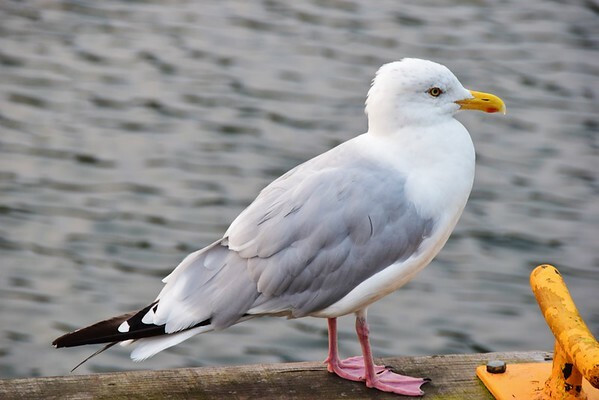 Only my gull friend was out and about. Last night the ranger told us that the moose count was 1,250 last year, and with this spring's births, they think the count might be up around 1,600. With the decline of the wolf population on the island (only three left and one of those is badly deformed), the moose population will have no natural control. Though the moose numbers are up, the moose sighting are down. The theory is that the moose aren't being pushed and moved by the wolves, so they are staying put in their hidden feeding grounds. Still, the couple we met yesterday from Tennessee saw two. Hopefully, we'll have a great moose encounter before we leave on Tuesday. After our peanut butter/banana oatmeal, we cleaned up, and then packed up for today's hike. The 6.3-mile trek would be our longest so far as new overnight backpackers (this is only our second trip). We headed out of camp around 9:00 hoping to make it to Lake Richie in time to get a campsite. We had heard that several people were going there, so we might have to share a site. The good news is we made friends with a few of them, and that might come in handy. Linda led the way and set the pace. There are two trails out of McCargoe Cove, so I scouted them yesterday just to be sure we got on the right one. 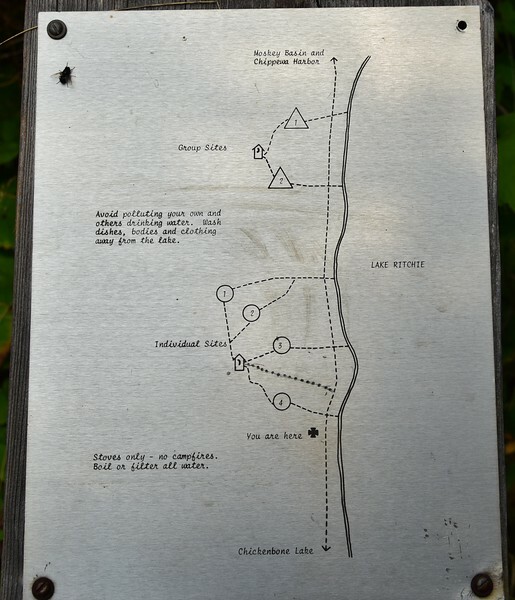 The other trail is the start of the Minong Ridge Trail, the 30-plus mile trail that is considered by far the hardest on the island due to its constant ups and downs. It's also one of the least traveled and, while that appealed to me, I knew we're just not quite up for that kind of challenge just yet. 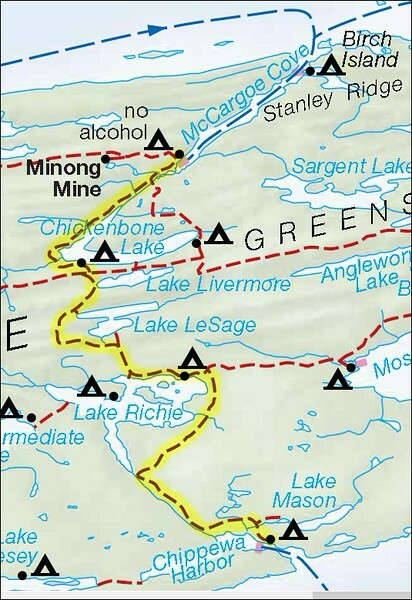 We figured on a break at West Chickenbone Lake campsite which would be just under half way to Lake Richie and just before our climb up to the Greenstone Ridge. It wasn't long before we came to an intersection. Left would take us to East Chickenbone camp and right (or straight) would take us to West Chickenbone, 2.4 miles ahead. We went to the right. The trail was flat and easy and Linda was moving at a pretty good clip. 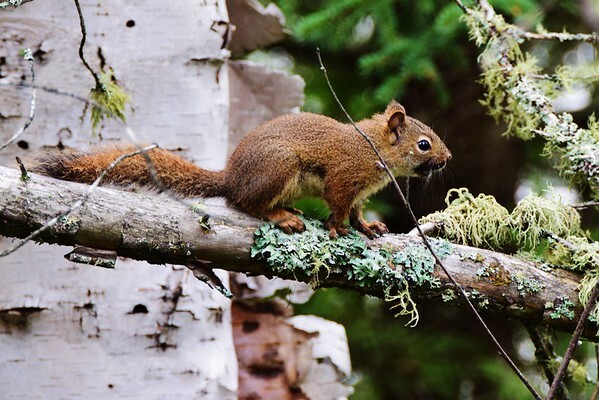 We got a good look at one of the abundant Red Squirrels that would be with us our entire time on the island. 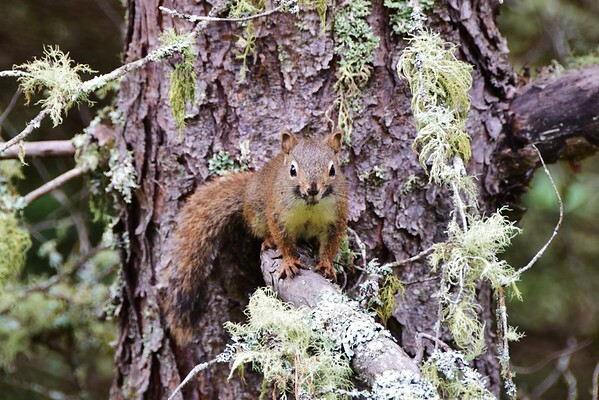 They would scramble through the trees and sound their chittering alarm whenever we arrived in their territory. 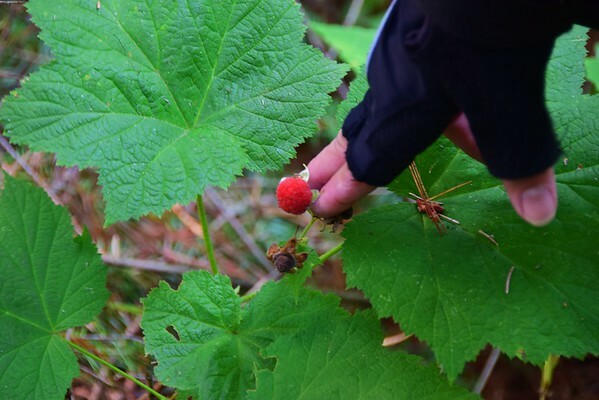 As we went along, we found a few ripe thimbleberries. 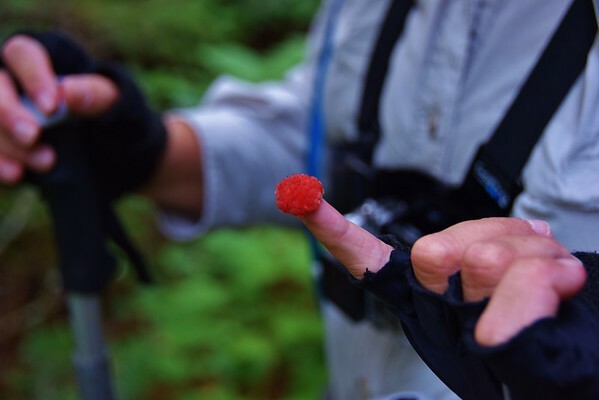 They are called thimbleberries because of the way they can sit on your finger like a thimble. They are often described as the raspberry's tart cousin. Linda decided she liked them better than raspberries, but I still prefer the sweeter berry. However, the raspberries and blueberries were all gone, so thimbleberries were our only wild berry choice on this hike. Oh, the ranger also told us there are no ticks on the island, so Linda was quite happy with that. That gave her the confidence to range off trail a good bit to grab a couple extra thimbleberries. By the way, we didn't see any poison ivy, and we hear that there is just a tiny bit in a different part of the island. 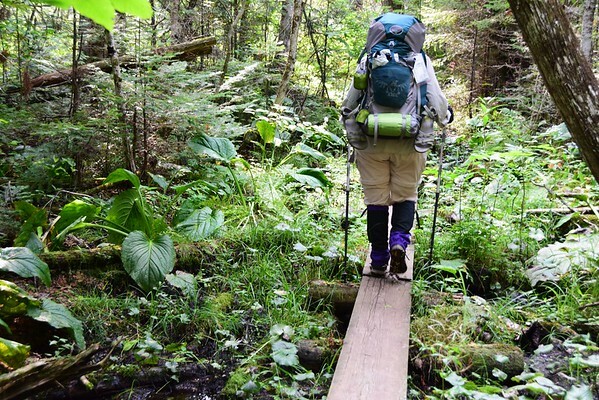 No ticks, no poison ivy, no bears, no wolf threat, and no venomous snakes - that makes for a much more worry free hike. 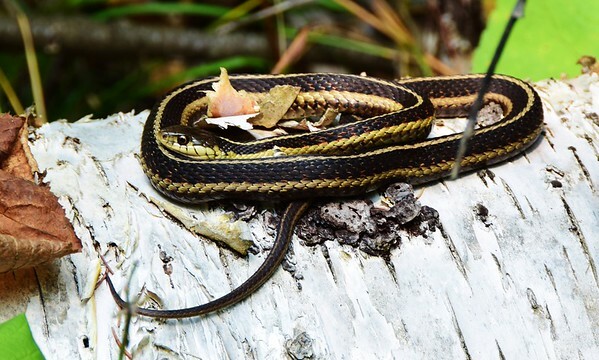 As we reached the north end of Chickenbone Lake, we started seeing signs of moose and, speaking of snakes, Linda spotted the first garter snake of the day. 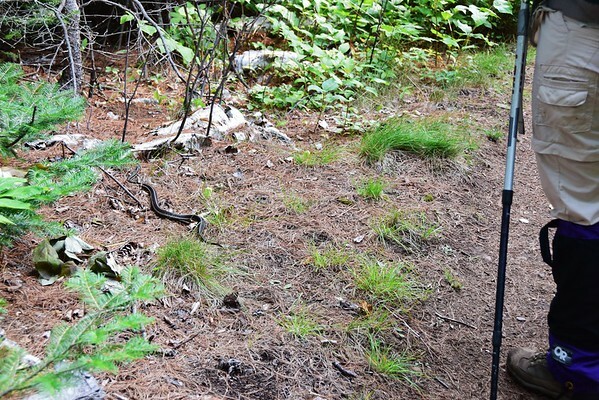 In the next two miles, we would see a total of eight snakes. 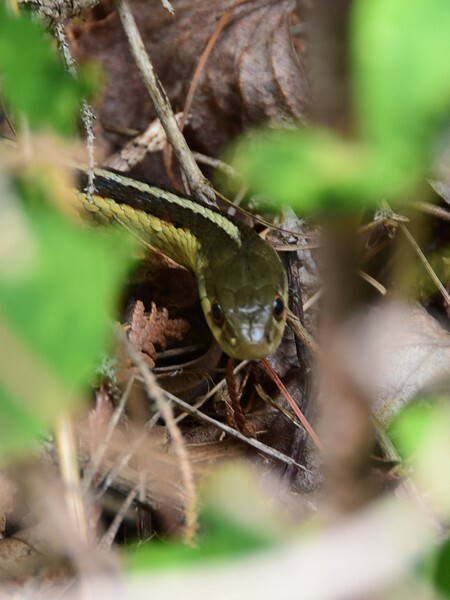 Good thing Linda doesn't mind them; in fact, she looks for them and was our snake spotter for today. 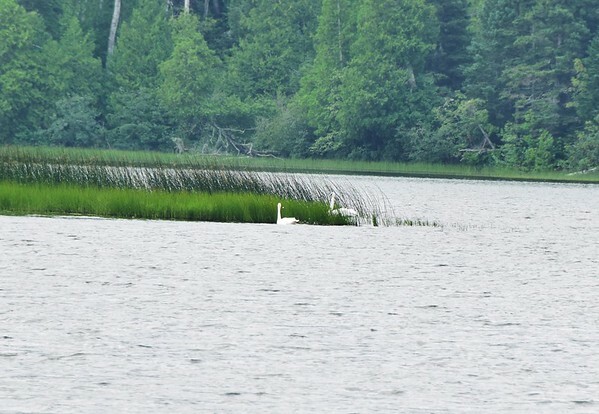 Also, on Chickenbone (named because it's shaped like a chicken wing) we saw a pair of Trumpeter Swans. In our rush to get packed the other day, I forgot my little pocket binoculars. I bet I don't do that again as I missed them terribly. and the heavy rains from a couple nights ago have the trails pretty muddy in many places. 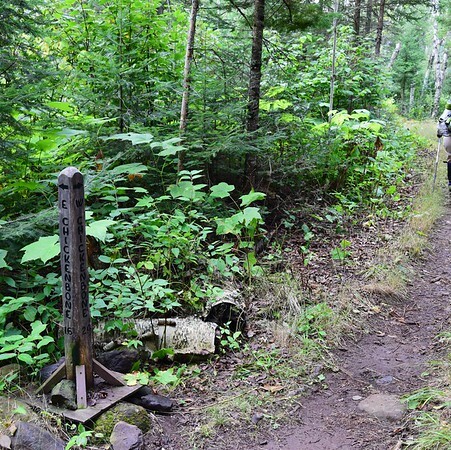 Of course, we've been told that the trails on Isle Royale are either rocks or swamp, a bit of an exaggeration, but not much. 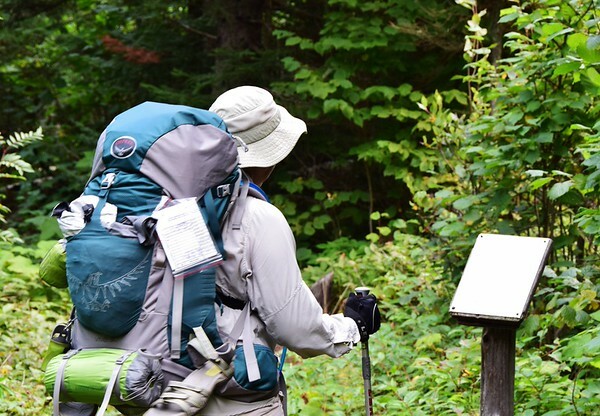 Soon, after a flat, somewhat easy three miles, we came to the West Chickenbone campsites, and Linda checked out the camp map to determine the location of the latrine for a break. It was here we came upon the largest garter snake of the day. Linda was wearing the GoPro on a chest mount as we're experimenting with it, so here's a short video of the snake. 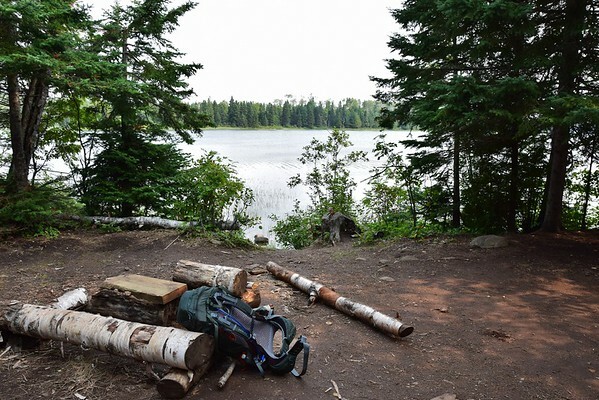 I put my pack down in a campsite on the lake while Linda hit the restroom. With our packs back on, we climbed up to the Greenstone Ridge, the ridge that runs the length of the island and the most popular end-to-end route for hikers. 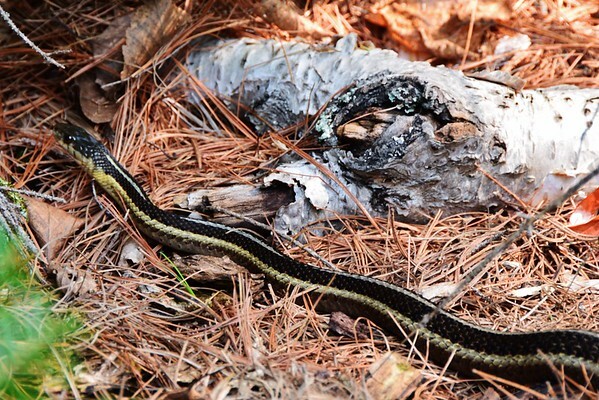 and saw another snake curled up on a downed birch tree. Here's a two-minute GoPro video of the terrain as we walk on planks in a wet zone and then up a steeper section. 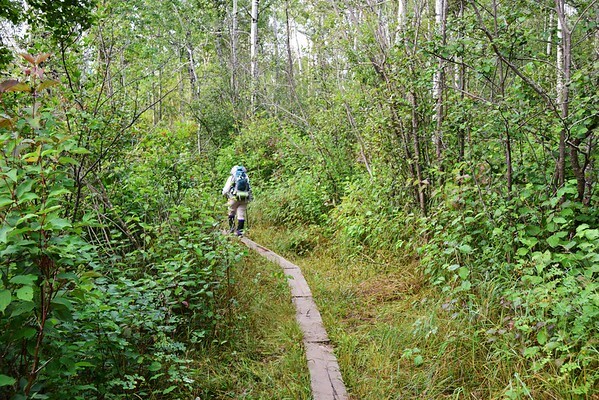 The video is a good sample of the trails we would traverse on our trip. 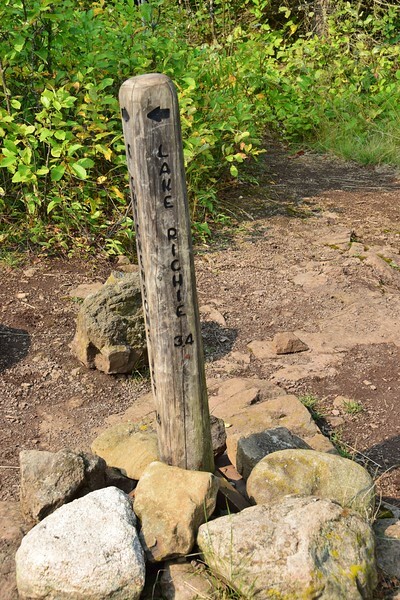 At the intersection with the Greenstone Ridge Trail, there was a signpost telling us we had 3.4 miles to go to Lake Richie. Fortunately for us, this point was one of the lowest elevations for the Greenstone Ridge, so our hike up and then back down the other side wasn't too bad. and we had a few parts of the trail where there were short, but steep, ups and downs. 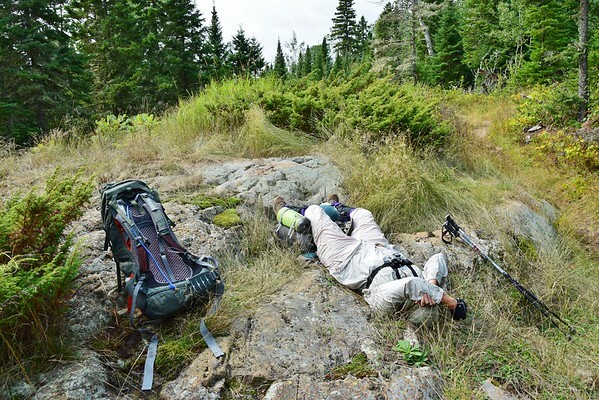 With about a mile and a half to go, we came to a rocky area that looked like a good place for Linda to get her legs up. We've learned that she gets to a point where she needs to lie down and just get her legs up for about twenty minutes. During that break, a 62-year old woman came by. 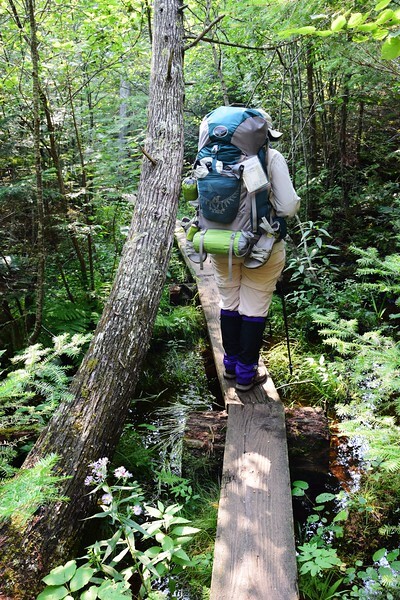 She came to the island with a group that stayed in Rock Harbor, but then she wanted to do some hiking, so she was backpacking by herself. After a conversation with her, we certainly felt like we could accomplish our simple hiking goals. Before long, we came to Lake Richie. About a half to three quarters of a mile after reaching the lake, we walked into the Lake Richie camping area. 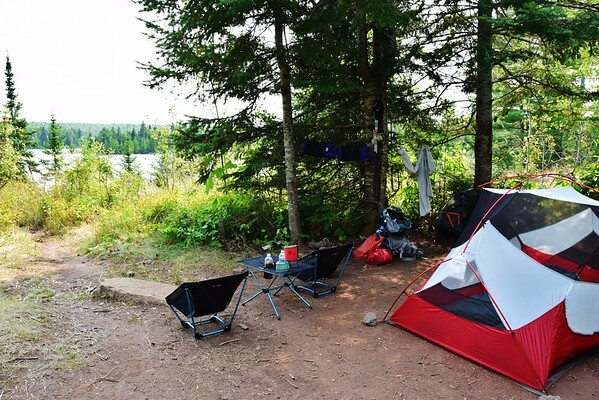 There are four individual tent sites, two group tent sites, and two latrines. There are no shelters here and no campfires are allowed. 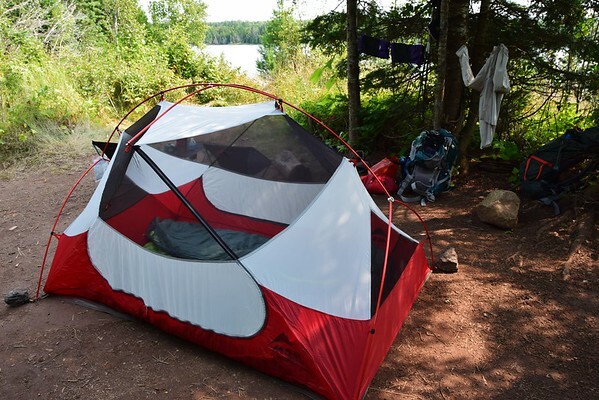 We arrived around 1:00 and there were two tent sites still available - Sites 1 & 2. 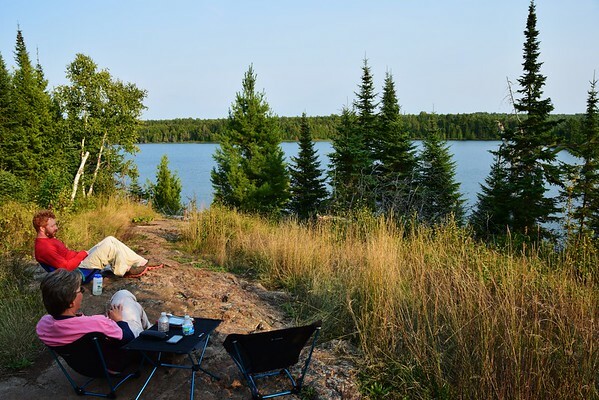 Site 1 was really private, but Site 2 had a view of the lake and it was big enough to share if others that we had met earlier needed to double up. Site 2 it is. We set the tent up in the more shaded area that was sheltered from the wind. So, today was our longest hike yet as new backpackers with 30-plus pound packs, and we did just fine. Linda said she probably had two more miles in her, and that was good to hear. It wasn't a particularly hard hike, but we were proud of ourselves nonetheless. After having our lunch of Jacks Links beef sticks, Doctor Kracker crackers, and Laughing Cow cheese, we did some reading. By the way, we were also turned onto Doctor Kracker by The Yummy Life blog, and we love them - they are substantial by themselves and they won't break or crumble while shoved in a backpack. Eventually, I got out my collapsible rod, attached the spinning reel, and walked down to the lake to try my luck. 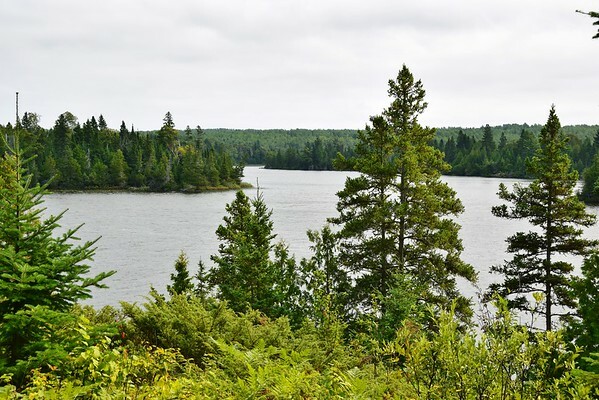 Michigan fishing licenses are required to fish in Lake Superior around the island, but no licenses are required on the interior lakes of Isle Royale. On my way to a fishing spot, I ran into Josh, a solo hiker from Athens, GA that we met on the ferry. We were expecting to see him here at Lake Richie. In fact, we thought he would arrive before us and we might have to ask him to share a site. As it turned out, all the sites were taken when he arrived, and he ended up sharing our site. I tried a few different spots with no luck. Here's a little GoPro video of me walking to the edge of the lake and doing some casting. I was hoping to reel in a fish for the camera, but it turned out the video is more about the scenery than the fishing - FYI it's a little boring, so feel free to skip it. I had one strike that I missed, but nothing else, so I went back to the campsite. 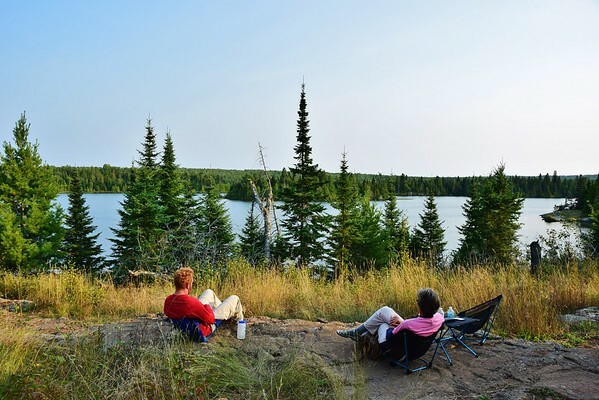 Linda and Josh had moved out onto the rocks for a better view of the lake. The wind had died down and it was a gorgeous evening. 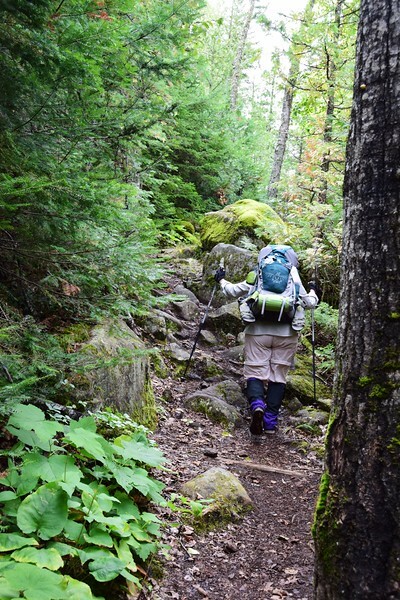 We all had our camp sandals on, and it wasn't easy going down the rocks to the lakeside trail without our hiking boots. That turned out to be a bad thing. Josh and Linda heard a large splash off to our left. 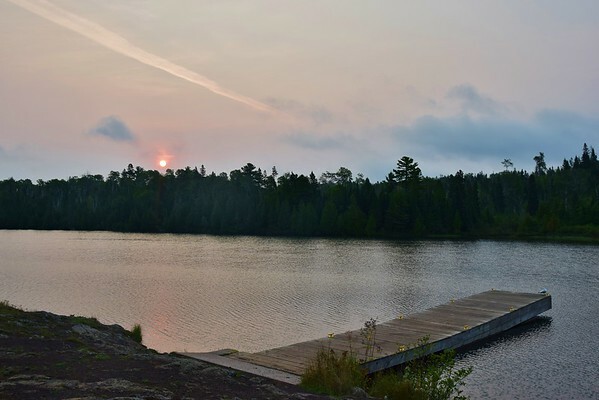 Since some folks had been swimming in the warmer interior lake earlier, and we didn't want to rush down the rocks in our sandals, we didn't go check it out. We later learned it was a moose, and we missed a great opportunity. Oh well. As dusk approached, Josh decided to go fishing, and we boiled our water for dinner. Tonight was Thai Peanut Noodles with veggies (from The Yummy Life blog). Very good, a favorite so far. After dinner, we sat out and talked with Josh. Later Brent, a solo hiker from Nashville that got a ride in on a seaplane today, joined us for some conversation as the sun went down and the full moon came up. Linda called it a night, and us three guys talked for a little while longer before going to our tents for what we hoped was a restful sleep. We had just a few mosquitoes as the sun went down, but otherwise the hike and the rest of the day and night were bug-free. Nice. 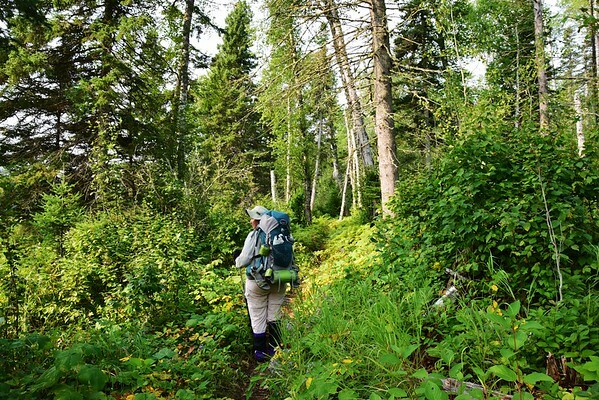 Day 2 on Isle Royale was complete, and I think Linda was enjoying the adventure more than she expected.